The word “Banting” has become synonymous with the LCHF way of losing weight by avoiding all grain, sugar and toxic seed oils, and sticking to a low carbohydrate, high fat and moderate protein eating plan. This centuries old word has re-emerged after over 100 years, made popular by the runaway best seller “The Real Meal Revolution” published in November 2013, a book I co-authored with Tim Noakes. So where did this delightful word come from? It is all thanks to a delightful gentleman – Mr William Banting – who lived in the middle 1800s. William Banting started his career as a carpenter, becoming an undertaker to the ‘beautiful people’ of his day – you might say he was the undertaker to the stars. He buried the wealthy and illustrious people of London – and was the person you would want as your undertaker if you were part of high society at that time. Undertakers are not typically celebrated personalities by any means, but this gentleman was different for a number of reasons, quite apart from the fact that he constructed the Duke of Wellington’s coffin. Banting suffered from what he called “the evil of corpulence” as he so eloquently put it. So much so, that he could not negotiate the stairs unless he descended them backwards “being obliged to puff and blow” while doing so, nor could he tie his own shoelaces. He developed an uncomfortable umbilical hernia which required the use of a truss to alleviate his discomfort and his weak knees and ankles had to be bandaged for relief. The unfortunate man later became afflicted with failing eyesight and diminished hearing making him a very unhappy man. He turned to prominent physicians for help with his weight, without success, including 20 hospital stays over a period of 20 years – without success. No-one had previously told him that all his other problems actually stemmed from his obesity, and he thought his state was incurable. Rowing on the Thames for 30 hours a week only made him hungrier and fatter, clearly exercise wasn’t the answer. The Turkish baths, spas, potions, horseback riding, walking, vapour baths and shampooing recommended by these specialists did nothing to relieve the physical ailments he suffered from, nor the new ones which started appearing, including gastric reflux, eczema, boils and carbuncles – the latter even needing an operation. He drank “gallons of physic and liquor potassae”, visited the spas of Leamington, Cheltenham and Harrowgate; he took the sea air, tried swimming and starvation diets – but found his energy even more depleted than ever. Nothing worked. By the age of 62, weighing in at 91.6kg and being just 1.67m tall, Banting’s hearing now began to deteriorate to the point of near deafness, which necessitated a visit to his friend and ENT (Ear Nose and Throat physician), Dr William Harvey. It was here Mr Banting found an answer to all his problems, later becoming known as the “father of the low carb diet”. So excited was Banting with the results that he decided to publish at his own expense a pamphlet to distribute free of charge, called Letter of Corpulence, to inform society in London of his miraculous weight loss on the diet provided to him by his doctor. It achieved global circulation, for which he was thrilled. It eventually achieved 5 revamped editions, was translated into 63 languages and he sold 63,000 copies in the UK alone, but the influence was even greater in Europe and the USA. He was rewarded with over 2000 letters of gratitude from those who found benefit from his book. Today William Banting’s fame is global, and in the UK there is even a little tour you can enjoy to his birthplace, home, offices and grave. Banting spent a lot of money and time putting together the information he received at that time via letters, but as he admits he had “leisure, inclination and means” at his disposal, deeming it a privilege to help his fellow human beings as he enlightened them on these “little known and much neglected laws of nature”. He admits in the early days he was subjected to ridicule and abuse, but later looked upon his ‘discourteous assailants’ with pity and sorrow as clearly they were unable to benefit from his experience. All he really wanted to do was share his excitement and success, offer them the benefit of his own experience and give the profits to charity. It seems whenever someone discovers a breakthrough there is a period of ridicule – Banting was no different to the mavericks of our day. Speaking of the diet, he notes in his writing that “I have not met with any case where harm has ensued from its practice under medical authority or supervision.” In fact athletes were given this very diet in Banting’s day to “increase muscular vigour in healthy people”, but hadn’t been tried on the wealthy or overweight. He noted too that it made advancing age more pleasurable and promoted longevity. Obesity was extremely rare until the 20th century, and was not common until around 1980 when the incidence rose dramatically. By 1992, one in ten American adults were overweight, in spite of increasing awareness, education and lowered intake of fat and calories. The pandemic continues to sweep the western world to this day. 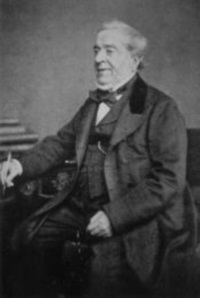 William Banting was not ‘qualified’ to write any sort of diet, yet his “Letter on Corpulence” became one of the most celebrated diet books ever written. Perhaps the best book on obesity ever written. His doctor, Dr William Harvey, had attended a conference in Paris where he heard Dr Claude Bernard, a physiologist, speak of his theory around the role of the liver in diabetes. Bernard had read “The Physiology of Taste” in 1825, published by lawyer and gourmand, Brillant-Savarin, in which he stated he had discovered the cure for obesity, being “More or less rigid abstinence from anything that is starchy or floury”. Bernard went on to spend an inordinate amount of time researching the function of fats, sugars and starches and their effects on the body. By the time Dr Harvey met William Banting, he was intrigued as much by his weight as his deafness, and thought the deafness could well have been brought about by his obesity, and promptly put him on a diet. Banting was very likely diabetic, or at the very least, extremely insulin resistant, but insulin and it’s effect on the body had not yet been discovered. Sir Frederick Grant, a Canadian physician, later won the Nobel Prize in 1923 in Physiology for the discovery of insulin. Banting wholeheartedly embraced Harvey’s advice and immediately began to lose weight and sleep better than ever before, something he’d had trouble with previously. Harvey’s advice included avoiding bread, butter, milk, sugar, beer and potatoes. We of course know today butter is not the villain, but in those days butter and pork were thought to contain starch, nevertheless the advice still worked wonders for Banting, who lost on average a pound (or 500g) a week for 46 weeks, leading to the publication of his now famous letter. In spite of the incorrect assumptions about pork and butter by Harvey – nowhere was Banting advised to remove fat from his meat or to limit it. We know today that there is no carbohydrate count to either pork or butter and we can enjoy them freely. Banting was neither hungry on this diet, nor felt deprived, noting “These important desiderata have been attained by the most easy and comfortable means … by a system of diet that formerly I should have thought dangerously generous”. He lost an enormous amount of weight and centimetres, had his hearing and sight restored, felt wonderful, and his other ailments reversed. He went down stairs forwards, could tie his shoelaces again and attend to all the “offices” a normal person needed to. There was plenty of delicious food to eat. Banting could hardly believe it and declared he had never eaten so well, announcing “more luxurious and liberal, independent of it’s blessed effect, but when it proved to be more healthful, the comparisons are simply ridiculous”. He couldn’t enthuse enough about his new found health, slim body, energy levels and delicious fare. The beauty of banting is that no real willpower is required, as there is almost complete absence of the hunger which plagues the dieter on every other type of diet. Add to this the fact that banting improves every other aspect of health as well, and you have the perfect diet which is eminently sustainable for life. While being easily sustainable as a diet which produces satiety, the food is also of a delicious nature. Banting was so enamoured with this diet he donated 350 Pounds to Harvey for distribution amongst his favourite hospitals, though he continued to feel he owed Harvey a debt he could never repay. Mr William Banting simply ate what everyone else was eating at the time before the marvellous diet Dr Harvey suggested, although he admits to eating a little more than he should have for his age and height. Yet as with people today, he didn’t know that the carbs he was eating were the culprit. As always, it’s all about education. Prior to meeting Harvey, Banting’s diet of bread, milk, sugar, pastry and fruit sounds eerily like the food most Westerners live on today. A few years later Banting went on to found and fund the Middlesex County Convalescent Hospital for working class people unable to afford to convalesce. The property in Walton-on-Thames he bought needed a lot to maintain, and together with his family members and patrons, a sum of 35,000 Pounds was raised. A fortune by today’s standards. Banting self-published the first 2 editions of his book and distributed them free of charge, totalling 2,500 copies (which cost him 6 pence each) and the third edition he sold at a Pound each. When the booklet was published it elicited a wave of protest and bitter controversy from the medical profession sparking ridicule and attack. The medical profession was threatened, and the criticism was so great that even Harvey’s practice began to suffer. The public were impressed with the miraculous weight loss they enjoyed, and the medical profession could no longer ignore it due to the almost outrageous success of this new-fangled diet. Banting died at a normal weight and in physical comfort in 1878 at the age of 81. An American, Dr Helen Densmore, took up Harvey’s baton some years later in 1890, where she had similarly incredible results with obese people using Banting’s material. She excluded all grains and starchy food in her dietary advice recognising that this was a diet one could stay on for life to remain lean and in excellent health. Is it any wonder our diametrically opposed diet of high carbs and low fat produce the opposite effects today in an era where the obese now outnumber the starving for the first time in history? I find it interesting too that Banting stated that quality rather than quantity is to be the focus of food, something we are extremely passionate about in the modern LCHF movement. It’s interesting to note that in 1869, 5 years after he discovered the secret to weight loss through LCHF, Banting published the 4th edition of his Letter on Corpulence, to inform London society of his miraculous weight loss. The letter (a small booklet actually) went into global circulation – reaching sales of 63,000 copies in the UK alone – all without Facebook, Twitter, a website, Instagram or any other sort of advertising! When something works, no advertising is needed. Taking under an ounce (28g) of sugar a day in just 5 days would cause his weight to go up by at least half a kilogram in that time. Such was Banting’s experience – we see exactly the same results today – 10s of thousands of people experiencing weight loss and freedom from various illnesses. See the sequel and updated version of the lists and work of the red book in the latest THE LOW-CARB CREED – new updated information and new Official, Updated Lists, much easier to navigate too. As I was the formulator of the original lists, they have now been refined and updated to give you a more accurate model to follow. Meal plans, weight loss secrets and recipes – it’s all in The Low-Carb Creed.